Corset 2.0 from Amy Crowder's Wasp Creations shop was a big success. Our redesign (measurements that worked) was a short, underbust design that Amy and I worked on together. Over all it was comfortable and I was very pleased with the fit after a short break-in period. A corset is very different from any elastic/stretch shapewear garment that continues to pull even after fitting it around. A corset, once close and laced is set at a position and level of tightness. I hope that makes sense - you only tighten (lace) it to your comfort level. There it stays. There are many positive aspects of wearing a corset. Wearing it every day does change the body shape over time. You are not able to eat as much, so dietary controls are in place. Plus your gait and movements are different - more feminine. Over time I became very comfortable with the look, feel and compliments. Under some clothing it is very noticeable, so I would choose items that did not exaggerate the effect. Blending in with a typical "Hour Glass" figure was my goal. How much did I wear it? Only about 8 to 9 hours a day while out or at work and seldom on the weekend, unless I had an event. I have had Corset 2.0 for well over 15 years and it shows its age. On multiple occasion I have taken a needle and thread to do repairs and only clean it by hand occasionally. Underneath I always wear a corset liner. A corset liner is something like a tube top that prevent skin chafing and absorbs sweat. A must during the summer, and the liner gets washed after every wearing. After a period of not wearing a corset for a few years (working at home), I re-laced Corset 2.0 and will be wearing it again. I love the look. It is battered from the wear and should have been replaced many years ago, however it still does its job. About 10 years ago I did have Amy make me a new corset but there was a problem. At that time she had gone to a front zipper in place of older steel busk as you see in the photo below. I never liked the zipper and it broke several times with Amy repairing it. My last time shipping it back was to replace the zipper with the traditional busk, however Amy passed away on May 22, 2010 before it was done. I miss Amy. Her craftsmanship, products and the many conversations we had over the years. She was an artist and a super interesting person. Tight lacing and corset design was her passion. She lived her passion - we should all be so fortunate. I will look for a new corset maker someday. There are a few left from what I see on the internet. Please share your experiences if you have a person that makes your corsets. Considering a corset? Corsets are not for everyone. There is the discomfort factor and getting used to that is not easy. Start with a few hours and work up from that. Not all body types allow for waist reductions/restriction. Also extended wearing takes endurance and adjustment to posture and body movement. Always be aware of potential health issues as well. 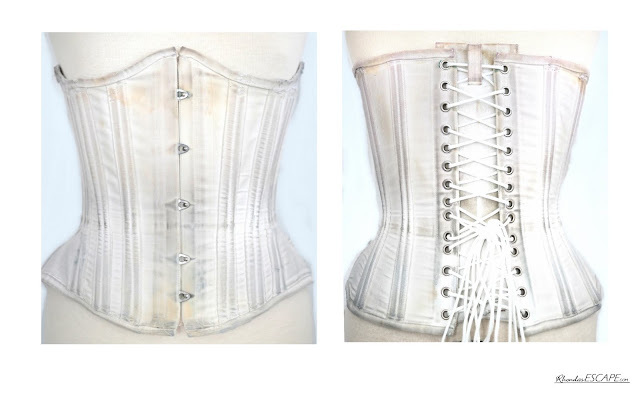 Tight laced corsets restrict the chest to a degree and can cause shortness of breath and elevate blood pressure. Now you know why Scarlett O'Hara in Gone With The Wind was always getting the "vapors". FYI - The movie does have a great Corset scene. Here is one of the benefits listed: Corsets are used to reshape and feminize the figures of trans women or gender fluid individuals: often making the ribcage more narrow, raising the apparent height of the waistline, and making the hips look fuller in contrast. These changes may help with any dysphoria they may experience by creating a figure they may consider more desirable or more easily identify with. Read more here. Point to keep in mind: Do not waste you time or money on an off-the-shelf/rack or simple "S-M-L" corset. They are for fashion and play. They will never hold up under serious tight lacing or daily abuse. So some of my new photos will be with Corset 2.0. I welcome your comments, and questions. Corset 2.0 - A Battered Old Friend.